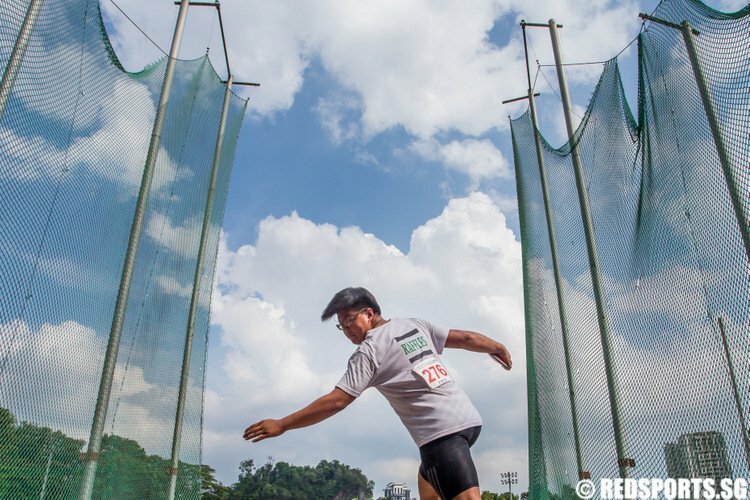 Story and photos contributed by reader Aaron Aik. 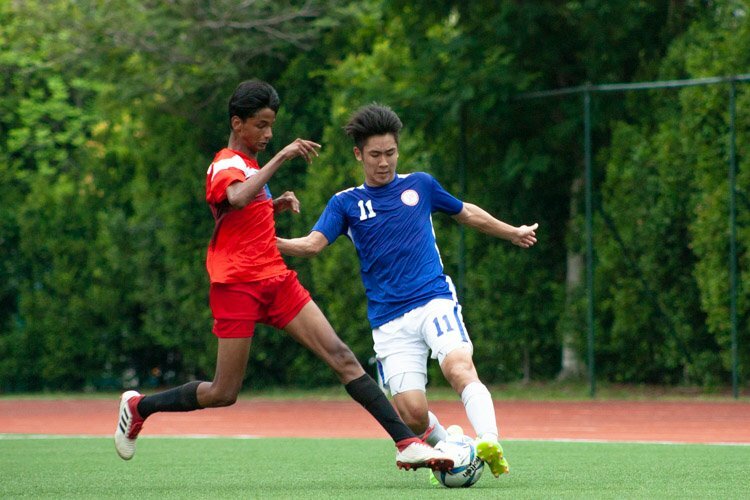 Meridian Junior College, Wednesday, July 29, 2009 – On July 7 2008, after a drought of more than 30 years, the Victoria School B Division soccer team finally made it to the national final, where they faced the team from the Singapore Sports School. Spectators from both schools turned up at the Jalan Besar Stadium in full force for the final. Both teams played their hearts out, but alas, the championship went to Sports School. Even though Victoria School had lost the match with their heads held high, they had to come back to fight for the coveted title once again. One year later, on July 29 2009, the battle was about to unfold yet again. 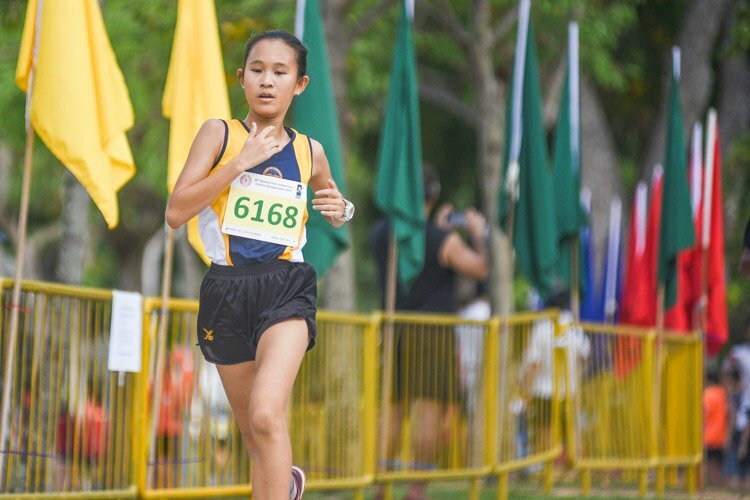 The Singapore Sports School have always been the leading school for many of the sports in Singapore, with many students having represented the country in international competitions. 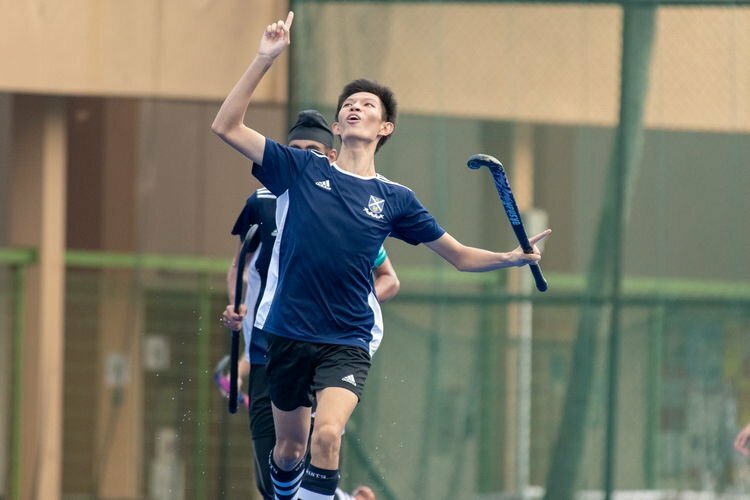 Despite having lost the North Zone title to Sengkang Secondary School, Sports School managed to make it to the national final again and were the favorites to win. 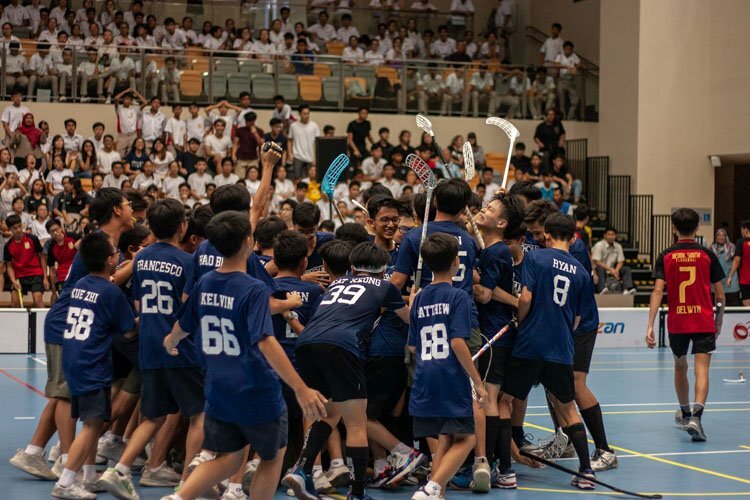 Victoria School, despite having won the East Zone title, were the underdogs in the championship. The B Division team had to face off against many strong schools around the country. 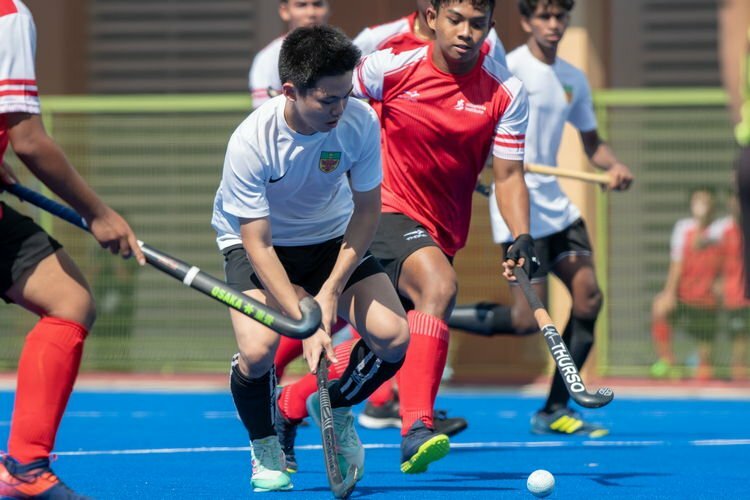 Having nearly lost out in the group stages, the team fought hard to get back on track, beating Serangoon Secondary School 2-1 in the semi-finals to qualify for the national final for the second straight time. This presented the team with another chance to win the National Schools B Division Football Championship. However, three of the team's key players were sidelined due to the H1N1 situation, and this made it even more difficult for the team. 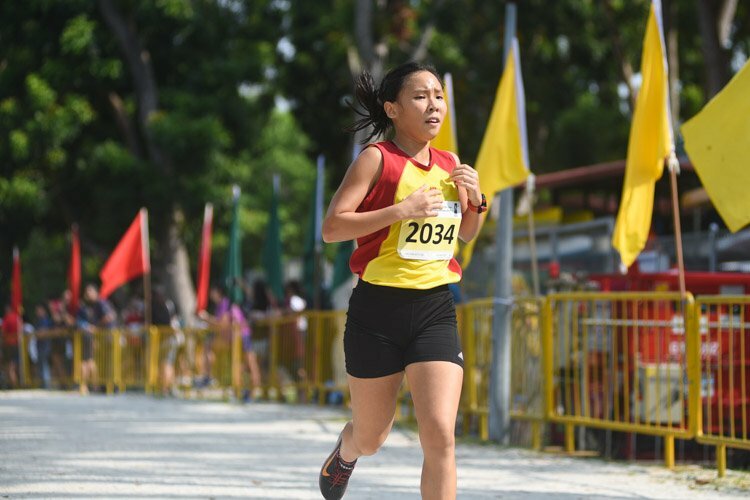 Meridian Junior College was chosen as the site of the battleground for Victoria School and the Singapore Sports School. 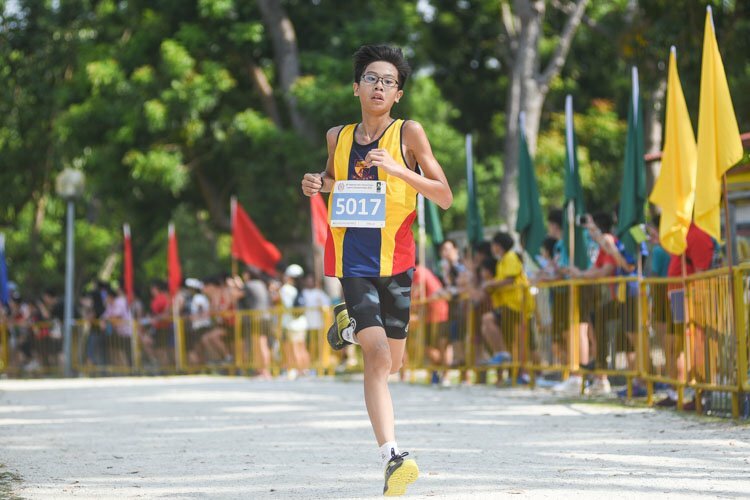 Despite the spectators’ area being smaller than the previous year, and the H1N1 situation still looming, many supporters from both sides still came forward to lend their support to their respective teams. A quick search on Google on "B Division National Finals 2009" and one will come across the blog of the Old Victorians' Association where a post was dedicated to help garner support to ‘be the 12th player on the team’, meaning to be there and give one’s fullest support. Even with a fairly equal number of supporters from both schools, the resonating cheers from VS threatened to drown that of the opponents. A glance across the Victorian section of the crowd and you can find boys from the school, both past and present, who had come to cheer on the school. Parents and teachers took time off their busy schedules to lend their support for this final match. A VS student was even spotted with a video camera filming the whole match. Despite fierce determination shown by the VS team, Sports School found the net first with Muhd Syimir Amisabudin (#17) scoring with a powerful long-range shot to make it 1-0. A goal wasn't going to stop the VS team from giving up. Barely six minutes after the goal by Sports School, Mohamed Amsyar B Omar Abdullah (#8) scored the equaliser, tying the game at one apiece. Both teams were evenly matched and the 1st half ended 1-1. Within the first 5 minutes of the 2nd half, Sports School was given a free kick. Despite the brave efforts of the VS defence, Sports School edged ahead 2-1 through their captain Muhammad Zakir Samsudin (#5). The confidence of the VS team was shaken, but the Victorian Spirit prevailed. Loud cheers erupted from the VS spectators as they encouraged the team not to give up, but to continue to fight on. The players were not letting their supporters down. They played with all their might to try and level the score yet again. However, the Sports School goalkeeper proved to be too quick, as he dived and prevented a shot from going into goal. This earned the VS team a corner. As the ball flew in a magnificent arc, Xavier Yen (#3) managed to get the ball after it was deflected from his teammate, and then tried to shoot into goal, but was blocked by a Sports School player. Santosh Magar (#16) then pounced from behind Xavier to scored the equalising goal once again, leaving Sports School stunned. With renewed confidence, the VS team prepared for the kick-off to find another window of opportunity to strike again. Lady luck, however, wasn't on their side as Muhd Raushyan Mazlan (#2) found the net for Sports School just 5 minutes after the second equaliser to give Sports School a 3-2 lead. Even with the tight defence and strong offense from the VS team, Muhd Muhaimin Salim managed to score yet again for Sports School for his team to lead 4-2. Time ticked by slowly for the VS supporters. The minutes passed and the VS team tried extremely hard to put another goal into the Sports School net. They weren't about to give up on their dreams just yet. 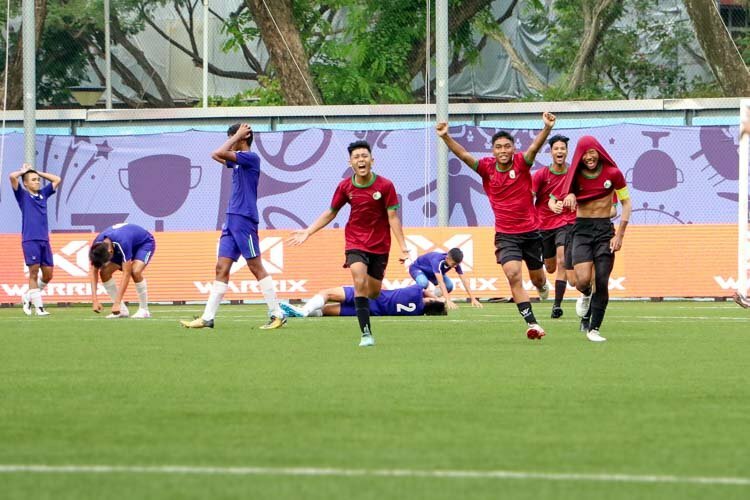 Their efforts paid off in the 71st minute when Muhammad Iskandar Zakarya (#21), with help from his teammates, managed to score and reduced the deficit to only one goal. With time ticking down, players from both sides began to get tired. The VS supporters knew the game wasn't over, and the banging of drums and screaming of cheers would erupt over at their corner in the stands almost every few minutes. 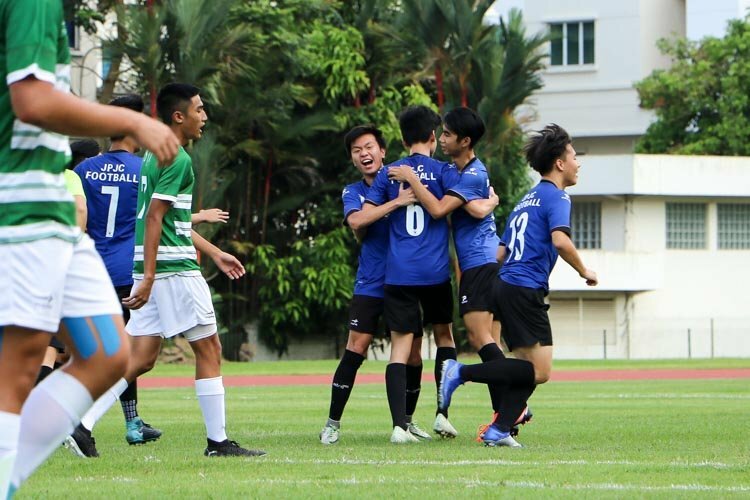 But in the 83rd minute, Sports School’s Muhd Muhaimin Salim, who bagged his team’s third goal, managed to score yet again, giving his team a crucial 2-goal advantage at this late stage. The dreaded final whistle blew and Sports School had won a very close fight 5-3 to take home the B Division Championship title. The VS team and supporters were no doubt disappointed, but the loss did not dampen their moods as they cheered first for Sports School, and then for Victoria School. Players from both teams congratulated one another for the wonderful play displayed by their teams. As the VS team went back to their own area, each and every player shook hands, thanking one another, their coaches and their teammates for helping one another bring their team to the national final for the 2nd consecutive time. And finally, every team member stood and held hands, faced the VS crowd and bowed to show their appreciation for the unending support. Cheers erupted from the VS crowd as they acknowledged their team's success. And as the rest of the crowd dispersed, the VS team and supporters continued to stay on the field. With flags held high and every VS student present, the Victorian Anthem was sung. In the midst of the crowd, the principal of Victoria School, Mr Low Eng Teong, was spotted right in the centre among them, singing the school anthem with all his heart. This was indeed a rare moment for the VS team and community. A special mention goes out to Team Captain Dilip Thapa (#10), Bijaya Thapa (#9) and Prasith Nair (#11) who were unable to play due to the H1N1 virus. 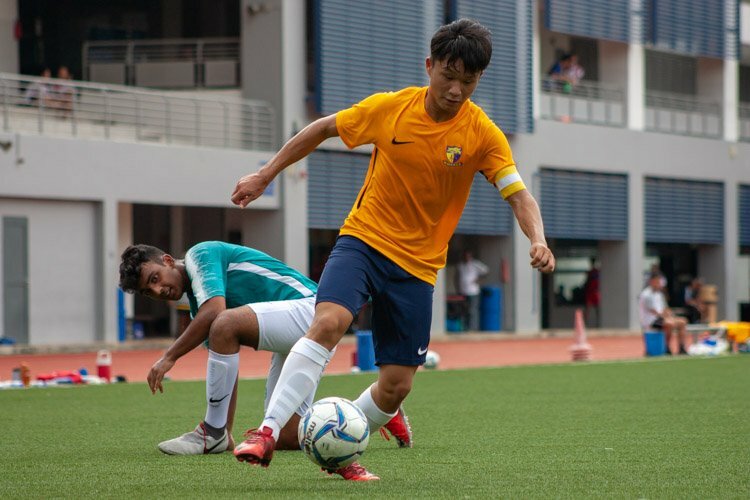 Without their efforts and dedication to the team for the previous matches in the group stages, quarter and semi-finals, the Victoria School B Division Soccer Team would not have made it this far. With tremendous valour, determination, passion and indomitable spirit, the VS team scaled greater heights when they believed in their ultimate goal with every single breath they took during the game, and their hunger to achieve it grew as they fought on for the coveted national title. As a teacher from Victoria School said, "It's not whether you win or lose, it's how you play the game." Even though Victoria’s football boys did not win the championship title, her students know that in their hearts, the VS B Division Soccer Team will always be champions. Nil Sine Labore (Nothing Without Labour). VS C Division is going to play tomorrow. At Jalan Besar Stadium if I am not wrong? Yeah. Their opponents is the Sports School. I am a player from vs soccer c div team and we did not lose 7-3 in the semis, we lost 1-0. and we qualified for the finals cos the striker is actually supposed to be suspended but he played, therefore Greenview sec is disqualified. FYI, the C Division lost 7-3 in the Semi Finals. well done Victoria School boys! VS has always been something more. which are the 2 schools in the other semis, besides Victoria vs Greenview? How is VS C Division football doing? VS was 1992 C Division champions, and was in the C Division finals a few other times.